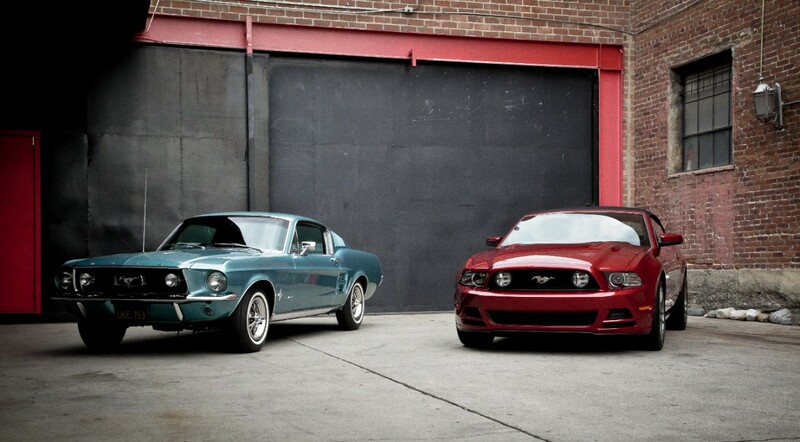 The 2014 Ford Mustang GT sits next to the original GT. The 2014 Mustang GT remains largely unchanged for the 2014 model year. The Ford Mustang GT is one fiery mustang. The GT is the bolder and faster version of America’s muscle car and sports an aggressive grille, bold taillights, and sculpted lines. When it comes to exterior features, the GT comes with everything on the base level Mustang, plus 18-inch alloys, automatic headlights, a rear spoiler and fog lamps on the exterior. The Mustang GT comes standard with a 5.0-liter V8 that creates 420 hp and 390 lb-ft of torque. The V8 is paired with a standard six-speed manual transmission – buckle up and hang on, the GT goes from 0-60 mph in just 4.7 seconds. The GT can also be outfitted with upgraded Brembo brakes and two performance axles (3.55:1 or 3.73:1) for even quicker acceleration. The standard manual transmission gets an EPA estimated 15 mpg city, 26 mpg highway, and 19 mpg combined fuel efficiency rating and a rating of 18 mpg city, 25 mpg highway, and 20 mpg for the automatic. The Ford Mustang GT has a well-designed interior, including all the technology we’ve come to expect in a car, a powerful Shaker Pro sound system, and SYNC with MyFord Touch. The 2014 Ford Mustang includes front-seat side airbags, stability and traction control, antilock disc brakes, and hill-start assist all standard. Also available is the Ford MyKey system, which allows car owners to limit maximum speed for younger drivers, and a rearview camera. In government crash tests, the GT has earned four out of five stars, and the best rating of “Good” in the Insurance Institute for Highway Safety’s crash tests. Morristown Ford is located in Morristown, Tennessee and we are proud to be one of the premier Ford dealerships in the area. From your first step into our showroom you will see our 100% commitment to Customer Satisfaction. Our #1 goal is to make your experience at Morristown Ford second to none.